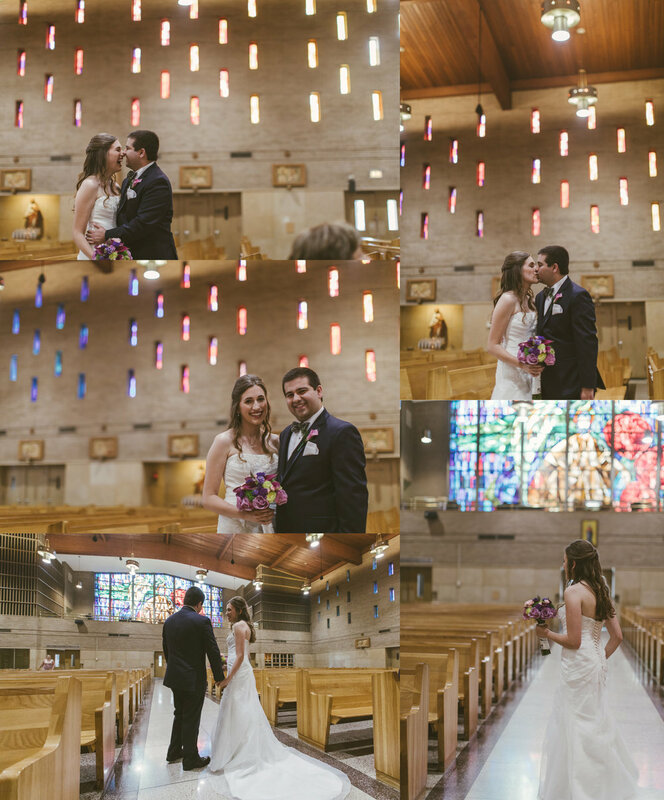 A few days ago over the weekend we photographed Mikayla & Matthew’s wedding here in South Bend, Indiana! You may remember these Minnesotans from earlier this spring/ summer when we photographed their Engagement Session down at Purdue University here in Indiana where they originally met and started dating (*they drove in all the way from Minnesota)! These two were wed on September 22nd, 2018: The first day of Autumn/ Fall! Luckily though the week had started out nearly 90 degrees with unpredicted rain throughout the week, the rain held off for their wedding and it was perfect fall weather with a few clouds and the temperature being a little below 70 degrees-! These two already headed out to their honeymoon at 9 a.m. the day after their wedding, so they’re off enjoying Greece at the moment-! Though they’re off enjoying their honeymoon, we’re going to go ahead and share our favorite teasers from their wedding-! The wedding day started off with Mikayla and Matthew at the grandiose Double Tree Hilton in downtown South Bend, Indiana. (Mikayla is originally from the area, so the choice to have their wedding in South Bend, Indiana meant that many of their guests came in from all over including their new home state of Minnesota!) Mikayla and her bridesmaids got their hair and makeup professionally done up on the 8th floor of the Double Tree while Matthew and his groomsmen headed over to St. Matthew’s Cathedral (church) about 10 minutes away to prepare, watch some Purdue (their alma mater) football on their phones, and get dressed in the church basement. Once Mikayla and the girls had their hair and makeup done, they headed over to the church as well (to get their dresses on in the Cry Room (a closed room in Catholic churches where families can take their crying babies and still see/ hear the mass, but not be heard at all). Once everyone was at the church (over an hour before the ceremony), the bridesmaids helped Mikayla get her dress on and got dressed themselves. Matthew put on a custom word tie that Mkayla had given him back when they started dating at university (her having said at the time “you should wear this for our wedding if we end up getting engaged someday!”) and things were all ready. Guests started arriving to the ceremony and you could hear everyone chatting away near the entryway right next to where Mikayla and the bridesmaids were getting ready. Mikayla greeted a few who came to visit her, snuck some peeks into the church from the Cry Room, and soon it was ready for their Wedding Ceremony! We were excited to finally be at St. Matthew’s photographing Matthew and Mikayla’s wedding ceremony especially since we’d just been to St. Matthew’s for Jenny’s cousin’s wedding 2 months ago almost to the day, so we had been getting excited since then for their wedding for the months leading up to it. St. Matthew’s is a large Catholic cathedral with beautiful golden gilded paintings up behind the altar. Instead of large stained glass Biblical murals lining the sidewalls like many of the 21 Catholic churches in South Bend, the walls are lined with unique long, narrow colored pieces of glass which make a gorgeous backdrop for the ceremony. These two went with a traditional full Catholic Nuptial Mass to make their marriage official. The ceremony included a meaningful homily by the priest officiating the ceremony, as well as a Eucharist presentation after the exchanging of the rings. The ceremony itself was unique as the couple chose to sit at the front of the church accompanied by their maid of honor and best man, who kept them company for the entirety of the ceremony. After all the formalities of the ceremony were taken care of, the two shared their first kiss as a married couple before being announced as man and wife and walking down the aisle hand-in-hand. Once Mikayla and Matthew came down the aisle a married couple, they greeted some of their guests, then promptly made it back to the front of the church. There were about 45 minutes to get all of their formal family portraits and couple portraits within the church, so we made it through the list of formal portraits one-by-one to make sure that we captured all of their desired photos of family! Once we wrapped up at the church, we headed outside where Mikayla and Matthew’s chariot awaited: A semi-open air trolly for they and their bridal party! We hopped in and headed 10 minutes into downtown South Bend again: This time for formal portraits of the bridal party, individual portraits, and the couple photos within the city! We’d location scouted that week and decided on 3 spots in downtown South Bend that we thought would be great: One spot for the full group photo and a few of the newly married couple, one for the portraits of the bridesmaids and Mikayla, and one spot in the heart of downtown. Once we got outside we headed over a block to the Morris Performing Arts Center and captured some more portraits of Mikayla and her bridesmaids. Once finished there, we walked a couple blocks back and wrapped up some final portraits in the middle of downtown South Bend! The bridal party and then Mikayla and Matthew were announced into the reception and the festivities began immediately! Mikayla’s dad gave a welcome speech, grandma gave the blessing, and then it was time for the speeches! The hall was beautiful for their reception! The bridesmaids’ dresses were a gorgeous rose hue which lended nicely to the purple and pink hues of the reception! The flowers, candles, and petals covered the guests’ tables and we even caught a few of the photo Engagement Session prints we’d made Mikayla and Matthew floating around the reception! One of our favorite things of the reception was that they (on top of cake for everyone) also had a candy station! There were various beautiful jars of high end candies so that people could take clear candy bags and fill them with their favorite candies! (We may have snuck a piece of candy or two while photographing the end of the reception). Mikayla’s younger sister gave her sweet speech and toast to the couple and Matthew’s brother also came through with a fantastic Best Man speech and toast! Matthew also gave a Thank You speech on behalf of he and Mikayla saying that though it had been a little bit of a whirlwind coming in from Minnesota, heading to Michigan, then coming down to Indiana for their wedding, that they were filled with extreme gratitude for everything and everyone who helped make things so wonderful. Once the speeches were made, it was time to cut the cake! Matthew and Mikayla sweetly fed each other a bit of cake, then it was time for dinner! During dinner Jason headed off to photograph their rings up close and we both enjoyed the Polish-esque dinner after having photographed for about 6 or 7 hours straight! After dinner Mikayla and Matthew enjoyed their first dance. These two threw in many dips, spins, and some nifty swing dancing moves before their first dance was up! After their First Dance was the father-daughter and mother-son dances. It was a beautiful time and we definitely caught Mikayla choking back tears as well as Matthew and his mom crying together a tiny bit. Once Open Dance started, there were over 3 hours of dancing! There were anniversary dances, slow dances, and of course some traditional wedding dances thrown in. During the dancing we also heard Sweet Caroline to the tune of a Purdue fight song (and in it may have bashed their rivals Indiana University.) All of their friends danced along, and then the parents flooded the floor even mouthing the words to current fun pop songs-! Mikayla and Matthew also played the infamous Shoe Game and of course threw their garter and bouquet to a couple of their lucky friends! Near the end we captured a few more group portraits including a couple secret ones outside of Matthew’s fraternity (that we’re not sure if we can share here, so we haven’t) and then captured some last portraits of Mikayla and Matthew before wrapping it up! Congratulations again, Matthew and Mikayla on your gorgeous, fun wedding day! We had a blast photographing you two again and are so happy for you! We hope you’re loving your honeymoon in Greece and we can’t wait to hear all about it! Mikayla and Matthew kindly invited us to stay an extra half hour after we packed up to enjoy a bit of the tail end of the reception. Thinking that it’d be nice to hang out somewhere dark and kick our feet up somewhere we haven’t been in OVER a year since we knew we had to work photographing Engagement Sessions the following afternoon/ evening at Notre Dame, we headed over to The Exchange in downtown South Bend. Not 5 minutes after we got seated, surprisingly 8 of Jenny’s cousins & aunt + uncle came in with a few of their friends (having just attended a wedding at The Armory and reunion together) and we hung out with them for the remainder of the night! Another surprise showed up there as well: Mikayla and Matthew! After their reception ended they also randomly showed up at The Exchange! We couldn’t believe our luck (since we never randomly head anywhere after photographing a wedding for 10 hours) and think that it must have been fate that we run into all of them again (considering how many places people can go)! It was truly the best night and we even caught Mikayla getting a photo taken with another bride also in her wedding gown! There were about 7 weddings that we passed in downtown South Bend earlier in the day, so you could definitely tell that it was the first non-Notre Dame game weekend in a while-! ***Unrelated: Up next for next Weekly Wednesday to start off October we have Lex & Jessica’s Notre Dame Engagement Session! We’ll be photographing the wedding of these two within the first week of March at The Morris Performing Arts Center and Palais Royale, so we were excited to capture their Engagement Session and can’t wait to print their photos for them! Their wedding will start off our already filling up 2019 wedding season and we absolutely cannot wait to plan things with them! We’re already planning the weddings of some of our 2020 wedding clients, so we’re excited for what the next 2 years of photography have in store! Until then we have a hectic October starting next Monday with 4 weddings, 2 Engagement Sessions, a Corporate Photoshoot, and 3 Fall Family Portrait Sessions to capture, so we’re excited for weekends filled with those 10 groups-! We have to have all of that edited before Thanksgiving and then will be creating all of the physically printed photos throughout December for all of our awesome clients! ((We’re thinking about throwing in a 2-day camping trip at the end of October to say goodbye to camping and good weather for the year, but other than that we have prioritized all of the future photo work for the remainder of the year-!)) We’ll catch ya next week with Lex and Jessica’s Notre Dame Engagement Session!